A symbol located at the beginning of a staff to indicate the pitches of the notes placed on the lines and spaces of the staff. The G clef is so named because the symbol is a stylized letter "G" that encircles the line of the staff, indicating where the "G" above middle C (G4 or g1) is located. 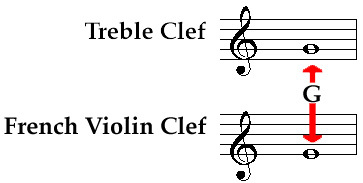 The two G clefs still recognized today are the treble clef (with the second line of the staff being G4 (g1 ) and the rarely used french violin clef (with the first line of the staff being G4 or g1 ).